where 0 is the angle of the ray to the normal to the body's surface and the angular integration is taken over the hemisphere of rays leaving the surface of the body. With this definition, the net flux emerging from any patch of the body's surface is F = e-T4. Even if e does not depend explicitly on temperature, e will be temperature dependent if e is frequency dependent, since the relative weighting of different frequencies, determined by B(v, T) changes with temperature. The Planck function is unambigously the natural choice of a weighting function for defining the mean emissivity ee for an object with temperature T. There is no such unique choice for defining the mean absorptivity over all frequencies and directions. The appropriate weighting function is determined by the frequency and directional spectrum of the incident radiation which requires a detailed knowledge of its source. If the incident radiation is a blackbody with temperature Tsource then a should be defined with a formula like Eq. 3.20, using B(v, Tsource) as the weighting function. Note that the weighting function is defined by the temperature of the source rather than by the temperature of the the object doing the absorbing. As was the case for mean emissivity, the temperature dependence of the weighting function implies that a will vary with Tsource even if a = a(v) and is not explicitly dependent on temperature. Absorptivity and emissivity might appear to be independent characteristics of an object, but observations and theoretical arguments reveal an intimate relation between the two. This relation, expressed by Kirchhoff's Law of Radiation is a profound property of the interaction of radiation with matter that lies at the heart of all radiative transfer theory. Kirchoff's Law states that the emissivity of a substance at any given frequency equals the absorptivity measured at the same frequency. It was first inferred experimentally. The hard-working spectroscopists of the late nineteenth centuries employed their new techniques to measure the emission spectrum I(v, n, T) and absorptivity a(v, n, T) of a wide variety of objects at various temperatures. Kirchhoff found that, with the exception of a few phosphorescent materials whose emission was not linked to temperature, all the experimental data collapsed onto a single universal curve, independent of the material, once the observed emission was normalized by the observed absorptivity. In other words, virtually all materials fit the relation I(v, n, T)/a(v, n, T) = f (v, T) with the same function f. If we take the limit of a perfect absorber - a perfectly "black" body - then a =1 and we find that f is in fact what we have been calling the Planck function B(v, T). In fact, it was this extrapolation to a perfect absorber that originally led to the formulation of the notion of blackbody radiation. Since f = B and I = eB, we recover the statement of Kirchoff's law in the form e/a = 1. The thought experiment sketched in Fig. 3.12 allows us to deduce Kirchhoff's law for the mean absorptivity and emissivity from the requirements of the Second Law of Thermodynamics. We consider two infinite slabs of a blackbody material with temperature To, separated by a gap. Into the gap, we introduce a slab of partially transparent material with mean absorptivity a(Ti) and mean emissivity e(T1), where T1 is the temperature of the test material. Note that this system is energetically closed. We next require that the radiative transfer between the blackbody material and the test object cause the system to evolve toward an isothermal state. In other words we are postulating that radiative heat transfers satisfy the Second Law. A necessary condition for radiative transfer to force the system to evolve towards an isothermal state is that the isothermal state To = T1 be an equilibrium state of the system; if it weren't an initially isothermal state would spontaneously generate temperature inhomogeneities. Energy balance requires that 2a(To)aT4 = 2e(T1)aT-j4. Kirchhoff's law then follows immediately by setting To = T1 in the energy balance, which then implies a(To) = e(To). Note that the mean absorptivity in this statement is defined using the Planck function at the common temperature of the two materials as the weighting function. A modification of the preceding argument allows us to show that in fact the emissivity and absorptivity should be equal at each individual frequency, and not just in the mean. To simplify the argument, we will assume that e and a are independent of direction. 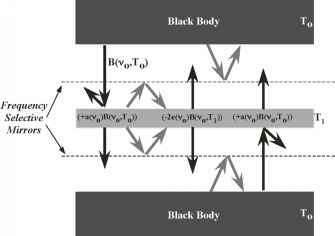 The thought experiment we employ is similar to that used to justify Kirchhoff's Law in the mean, except that this time we interpose frequency-selective mirrors between the test object and the blackbody material, as shown in Fig. 3.13. The mirrors allow the test object to exchange radiant energy with the blackbody only in a narrow frequency band Av around a specified frequency v. The energy budget for the test object now reads 2e(v)B(v, T1)Av = 2a(v)B(v, To)Av. Setting T1 = To so that the isothermal state is an equilibrium, we find that e(v) = a(v). Figure 3.12: Sketch illustrating thought experiment for demonstating Kirchoff's Law in the mean over all wavenumbers. In the annotations on the sketch, a = a(To) and e = e(Ti). Figure 3.13: Sketch illustrating thought experiment for demonstrating Kirchoff's Law for a narrow band of radiation near frequency vQ. The thin dashed lines represent ideal frequency-selective mirrors, which pass frequencies close to vQ, but reflect all others without loss. he presented a formal justification that eliminated the involvement of hypothetical ideal selective mirrors. The physical content of Hilbert's proof is that one doesn't need an ideal mirror, if one requires that a sufficient variety of materials with different absorbing and emitting properties will all come into an isothermal state at equilibrium. Hilbert's deriviation nonetheless relied on an assumption that radiation would come into equilibrium with matter at each individual wavelength considered separately. While Kirchoff did the trick with mirrors, Hilbert, in essence, did the trick with axioms instead, leaving the microscopic justification of Kirchoff's Law equally obscure. It is in fact quite difficult to provide a precise and concise statement of the circumstances in which a material will comply with Kirchoff's Law. Violations are quite commonplace in nature and in engineered materials, since it is quite possible for a material to store absorbed electromagnetic energy and emit it later, perhaps at a quite different frequency. A few examples that come to mind are phosphorescent ("glow in the dark") materials, fluorescence (e.g. paints that glow when exposed to ultraviolet, or "black" light), frequency doubling materials (used in making green laser pointers), and lasers themselves. In Nature, such phenomena involve insignificant amounts of energy, and are of no known importance in determining the energy balance of planets. We will content ourselves here with the statement that all known liquid and solid planetary materials, as well as the gases making up atmospheres, conform very well to Kirchoff's Law, except perhaps in the most tenuous outer reaches of atmospheres where the gas itself is not in thermodynamic equilibrium. When applying Kirchhoff's law in the mean, careful attention must be paid to the weighting function used to define the mean absorptivity. For example, based on the incident Solar spectrum, the Earth has a mean albedo of about .3, and hence a mean absorptivity of .7. Does this imply that the mean emissivity of the Earth must be .7 as well? In fact, no such implication can be drawn, because Kirchhoff's Law only requires that the mean emissivity and absorptivity are the same when averaged over identical frequency weighting functions. Most of the Earth's thermal emission is in the infrared, not the visible. Kirchhoff's law indeed requires that the visible wavelength emissivity is .7, but the net thermal emission of the Earth in this band is tiny compared to the infrared, and contributes almost nothing to the Earth's net emission. Specifically, the Planck function implies that, at 255K the emission in visible wavelengths is smaller than the emission in infrared wavelengths by a factor of about 10-19. Thus, if the infrared emission from some region were 100W/m2, the visible emission would be only 10-17W/ m . Using AE = hv to estimate the energy of a photon of visible light, we find that this amounts to an emission of only 50 visible light photons each second, from each square meter of radiating surface. This tiny outgoing thermal emission of visible light should not be confused with the much larger outgoing flux of reflected solar radiation. It is a corollary of Kirchhoff's law that e < 1. If the emissivity were greater than unity, then by Kirchhoff's Law, the absorptivity would also have to be greater than unity. In consequence, the amount of energy absorbed by the body per unit time would be greater than the amount delivered to it by the incident radiation. By conservation of energy, that would imply the existence of an internal energy source. However, any internal energy source would ultimately be exhausted, violating the assumption that the system is in a state of equilibrium which can be maintained indefinitely.